The event will open with the U.S. premiere of "The Divine Weapon" from director Kim Yoo-jin, starring Jung Jae-young and Ahn Sung-ki. "The Good, the Bad, the Weird", starring Jung Woo-sung and directed by Kim Jee-woon, will have its Hawaii premiere on the closing night, October 18th. Jung Woo-sung will receive the HIFF award for "Achievement in Acting". The spotlight on Korea continues with several Korean films, including "The Chaser", "Crossing", "Dachimawa Lee", and "Sunny". 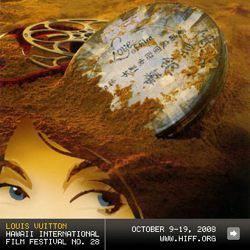 Established in 1981, the Hawaii International Film Festival (HIFF) is dedicated to the advancement of understanding and cultural exchange among the peoples of Asia, the Pacific and North America through the medium of film. Has premiered such movies as CROUCHING TIGER HIDDEN DRAGON, ONCE WERE WARRIORS, THE PIANO, SHINE, SHALL WE DANCE, Y TU MAMA TAMBIEN, VOLVER, BABEL, "The Host", "JSA - Joint Security Area" and TWILIGHT SAMURAI. Each year in preparation for the event, HIFF programmers view some 1,000 films and choose an average of 150 features, documentaries and film shorts. Among them are world premieres, North American premieres, American premieres, U.S. premieres, experimental films, films representing social and ethnic issues, and first features by new directors. HIFF also conducts annual seminars, international university student showcases, workshops, educational programs for primary and secondary school students, panel discussions, and special award presentation receptions with top Asian, Pacific and North American filmmakers participating. Music, films, animation, games and IT have come under one roof. The venue is the International Culture and Content Fair that began earlier this week. It's the first time Korea has hosted such a comprehensive event. A culture contents event, which combines contents business and culture festival, is held in Sangam-dong, Seoul for the first time in Korea.